PF Collections is a specialist bespoke upholstery manufacturer based in Long Eaton, an East Midlands town which borders both Nottinghamshire and Derbyshire. 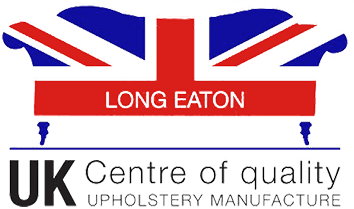 The town of Long Eaton is recognised worldwide for manufacturing quality upholstery and this reputation was further enhanced in 2015, when Long Eaton was declared an area of Excellence in Quality Upholstery Manufacturing. PF Collections is proud to be a founding member of Long Eaton Furniture Makers with the goal to promote Long Eaton made furniture and to ensure that the skills in manufacturing in the area are maintained. PF Collections is a privately owned family company, which was formed in 1988 by the current Managing Director, John Campbell. His wife Aileen and his four sons, Chris (Marketing and Design), Peter (Accounts), Michael (Production) and Tom (Sales) have since joined him in the business. Our wider family are our workforce, many of which have served the company for over 20 years and some since the day the company started. They are highly skilled and are proud to produce a quality British made product. Every piece of furniture we manufacture is proudly signed by the craftsman who made it. For nearly 30 years, PF has supplied some of the most prestigious stores in Europe and have worked with some of the leading interior design studios to produce bespoke upholstered furniture for both domestic and commercial projects. Our furniture is regularly exported and this year alone, our furniture has been shipped to Africa, Austria, France, Holland, Italy, Portugal and Spain. Excellent products, very stylish and great value for money. The most impressive of all is the customer service and after sales care! This is where most places really let themselves down but PF Collections stand out from the crowd! Sign up to our newsletter here and we will keep you up to date with our latest news and offers. This is where we will let you know what Trade Shows you can see us at and our latest product launches.